IHOP never really changed its name. A splashy social media campaign deployed last month to promote its new line of burgers only made it look like IHOb was the company's new moniker. "To be clear, we're always going to innovate around breakfast," he said in an interview with CNNMoney. Rebelez said IHOP expected some consumers to be confused -- and perhaps a little annoyed -- by the temporary name change to IHOb. But he said IHOP had to "do something bold and something creative" to break through the noise in all the marketing for food and restaurants -- even if it meant making some loyal pancake fans briefly upset. "We tested this idea in front of some of our guests and some focus groups and the reaction that we saw play out on social media is exactly what we saw in those focus groups: an initial emotional reaction, a rejection, no way can you do this," he said. 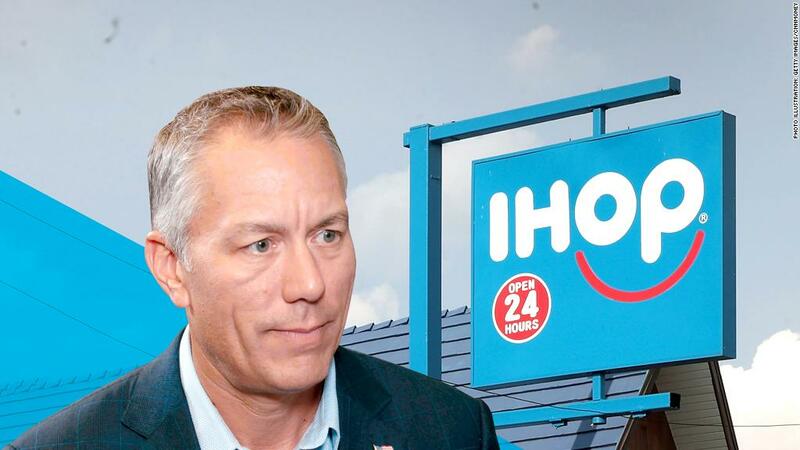 Once people realized that the IHOb campaign was meant to be more tongue-in-cheek, Rebelez said, customers "took a deep breath and said, 'Wow! That's really brilliant.' So we've seen that whole emotional roller coaster play out." IHOP's parent company Dine Brands (DIN) won't report quarterly earnings until August 1. So that will be the first time IHOP will give any specific comments about sales. Rebelez did say there were 20,000 news articles about IHOb and that the company was the No. 2 global trending topic on Twitter at the time of the name change -- just behind the summit between President Trump and North Korea's Kim Jong Un. "Literally everybody on the planet now knows that we're in the burger business," Rebelez said. Sales at restaurants open at least a year were up only 1% in the last quarter. Applebee's, the other chain owned by Dine Brands, grew sales 3.3% by way of comparison. Rebelez is hopeful that a new online delivery partnership with DoorDash, which competes in a crowded field with the likes of Caviar, Postmates, Uber Eats, GrubHub (GRUB) and even Amazon (AMZN), will help IHOP though. The deal with DoorDash could help IHOP capture more lunch and dinner customers. But Rebelez said DoorDash will also be able to deliver pancakes -- along with blueberries, whipped cream, syrup and other potentially messy breakfast side items. Rebelez added that IHOP worked hard to develop packaging that keeps colder toppings separate from eggs, bacon and, of course, pancakes. He joked that "protect the pancakes at all costs" became a mantra for the company. Note that he didn't say protect the burgers.